The regulatory environment facing resource developers in northern Canada. This report focuses on the geoscience, socio-economic issues, the regulatory challenges of mineral and energy resource development in northern Canada, as well as the case study on the Ring of Fire. Information on these topics is based on testimony from a wide range of witnesses from government, industry, Aboriginal groups, academia, and environmental organizations. Geoscience, particularly geo-mapping, can be used to guide investment decisions and help governments and the private sector assess resource potential in northern Canada. As mentioned by James Ferguson, Chair and Acting President of the Geomatics Industry Association of Canada (GIAC), “Geomatics (also known as geospatial technology or geomatics engineering) is the discipline of gathering, storing, processing, and delivering geographic information, or spatially referenced information”. According to Keith Morrison, Chief Executive Officer at Gedex Inc., low-cost, high-resolution, and high-quality geological information in northern Canada’s vast territory and remote environment is fundamental to reducing the investment risks and uncertainties associated with resource exploration and development in the north. Approximately 60% of the Canadian territories’ lands lack sufficient geo-science knowledge, as Figure 1 demonstrates. Source: Natural Resources Canada (NRCan) document presented to the Committee. According to him, even though Canada was “an international leader in geomatics post-World War II and into the 1980s, its status and ability at the federal level has fallen behind much of the developed world.” The GIAC is of the view that “the lack of a coherent, practical, and actionable national strategy and plan is at the core of this decline.” Although Canada is ahead of many countries, the state of “adequate geoscience knowledge” (mapping) remains more advanced in countries like Australia and Mexico. David Scott, from the Geological Survey of Canada, Northern Canada Division at Natural Resources Canada (NRCan), stated that Canada is “somewhere in the middle” in terms of geo-science competitiveness among countries, pointing out that, “owing to the sheer size of Canada and the logistical difficulties of working in remote areas of the country, particularly in the north, [geomatics in Canada are] not quite where [they] need to be from a private sector investment perspective.” The work of NRCan south of 60 degrees has been largely completed, according to him. “The provinces work on the next generation of detail.” The federal government is focusing its geoscience efforts north of 60 degrees, through programs such as NRCan’s Geo-mapping for Energy and Minerals (GEM). there are a number of examples of how government can partner with industry to ensure accessible data is available and to work together to prioritize the gaps in existing locations. In the field of geomatics, the following program is an example that is in place in Alberta: Spatial Data Warehouse Ltd. is an Alberta-registered, not-for-profit company created in 1996 to take over and fund digital mapping activities that were previously undertaken and funded by the Government of Alberta. It has proven to be one of the most successful P3 [public-private partnership] initiatives within the province of Alberta. Spatial Data Warehouse's objective is to provide for the long-term management, updating, storage and distribution, and associated funding of digital mapping data sets that collectively make up Alberta's digital mapping infrastructure. Since the late 1950s, Canadian geoscience has gone through major technological advances. As illustrated by Brian Gray of the Earth Sciences Sector, NRCan, “today we use modern tools to collect and distribute information beyond the typical bedrock geology mapping [and] [t]he modern mapping methods provide digital information distributed freely via the Internet. [...] The technology we're using: airborne geophysical surveys measure physical properties of the bedrock from the aircraft, such as a helicopter or a light fixed-wing aircraft; the aircraft flies back and forth over the land along parallel lines spaced about 400 metres apart, and the aircraft is about 150 metres off the ground. Down on the field level, we have field data collected by geologists using hand-held devices with pinpoint GPS accuracy.” With measurements of the magnetic properties of rocks below the soil, it is now possible to get a more complete picture of the bedrock, even when it is deeply buried. Gedex’s imaging technologies “are applied specifically to subsurface imaging, providing new data that can be used to interpret geology in terms of supporting petroleum, mining, and water exploration and development”. The technology can provide data from the surface down to depths of about 10 kilometres, including sub-ice measurements, to interpret subsurface geology. The Geo-mapping for Energy and Minerals Program (GEM) — a $100-million investment over five years (2008-2013), including (according to the best available estimates): $38.6 million in Nunavut; $26.4 million in the Northwest Territories; $15.6 million in Yukon; $2.9 million in Quebec; $2.3 million in Newfoundland and Labrador; $1.7 million in British Columbia; $1.2 million in Manitoba; and $1 million in Saskatchewan. Figure 2 presents an overview of GEM’s project areas in the Canadian territories. The Targeted Geoscience Initiative (TGI), which attempts to maximize the usage of existing tools and data bases. The GEM program is the federal government’s “flagship program under the northern strategy to address those areas of Canada where the basic framework mapping is not adequate to support private sector investment.” According to Brian Gray, approximately 75% of the GEM program targets areas north of 60 degrees, while 25% is devoted to the northern parts of British Columbia, Quebec, Newfoundland and Labrador, Saskatchewan, and Manitoba. Moreover, NRCan administers other geoscience programs, including a climate change geoscience program focusing largely on the north, a groundwater geoscience program mapping groundwater aquifers across Canada (exclusively south of 60 degrees), and the “targeted geoscience initiative”, which targets areas mostly south of 60 degrees. Under the intergovernmental Geoscience Accord, initiated in 1996 and renewed every five years, NRCan works with the provinces and the private sector to develop new models and exploration techniques targeting deeply buried ore deposits. The Canadian Northern Economic Development Agency (CanNor) has also invested $10.7 million towards geo-science research, through the Strategic Investments in Northern Economic Development (SINED) program. A database of geo-science was developed through the program, and is currently used to assess resource potential in the north. According to Richard Moore, “the geoscience knowledge provided by federal, provincial, and territorial governments as a public good is widely acknowledged to be one of Canada's competitive advantages in attracting mineral exploration, [... and is] essential for maintaining Canada's role as the leading destination for exploration investment.” An analysis by the PDAC estimates that every dollar spent on geo-mapping by the Geological Survey of Canada (GSC) may generate roughly five dollars in exploration, and possibly $125 in mining development (including downstream impacts, such as job creation), within a few years. On the other hand, Brian Gray, from the Earth Sciences Sector of NRCan, told the Committee that northern Canada’s remoteness and shortage in basic infrastructure (e.g., roads, boats, planes, hotels, etc.) would likely delay the return on investment of the GSC’s geo-mapping initiatives. According to James Ferguson, Canada’s geomatics business includes over 2,000 small, medium and large firms, providing close to 25,000 jobs across the country. The estimated annual gross revenue generated by geomatics firms exceeds $2 billion, including approximately $0.5 billion earned as export revenue. Furthermore, he stated that, according to a report prepared for the Canadian Council on Geomatics, employing geomatics more effectively could generate GDP gains of 0.6% to 1.2% (or approximately $9.5 billion to $18.9 billion annually). He added that, in another analysis funded by two private Canadian geomatics firms in 2010, Dr. Ian Lee, MBA director of the Carleton University Sprott School of Business, predicted GDP gains in the range of $7.3 billion to $14.4 billion. The growth of Canada’s mining industry has been evident in recent years. Since 2004, Canada has attracted between 16% and 19% of the world’s share of mineral exploration. Between 2006 and 2010, northern mineral production increased by about 53%. Nunavut, Yukon and the Northwest Territories accounted for about 6.3% of the value of Canada’s total mineral production in 2010, with diamond mining representing about 88% of all northern mineral production in terms of value. Mineral exploration and deposit spending amounted to about $498.1 million for the three Canadian territories the same year. Figure 3 presents an overview of mineral production in northern Canada. In the Northwest Territories (NWT), diamond mines represent between 36% and 41% of the territory’s gross domestic product (GDP) and provide about 8,000 direct and indirect jobs. In Nunavut, mining activities in Meadowbank contributed to an 11% increase in the territory’s GDP in 2010, according to Eberhard Scherkus, President and Chief Operating Officer of Agnico-Eagle Mines Limited. The Meadowbank mine employs about 500 people. In Saskatchewan, northern mine operations acquired $279 million in goods and services in 2009 from northern businesses (or 62% of all goods and services purchased); and in 2010, mining companies purchased $361 million’s worth of goods and services from businesses based in the northern regions of the province. In Quebec, while mining firms account for 1.4% of all firms in the province, the mining sector represents 5.1% of jobs, 10% of investments and 12% of exports. Exploration spending in the north, which has typically fluctuated over the years, is expected to increase due to the growing interest in northern resource development. According to Pierre Gratton, President and Chief Executive Officer of the Mining Association of Canada, “there is a race around the world for developing and finding new [mining] projects, and Canada is well positioned to benefit from that.” David Kilgour, councillor for the City of Greater Sudbury, also suggested that Canada needs a policy framework that would help the resource-rich areas of the country realize their full potential in terms of mineral resource development. The Mining Association of Canada has estimated “some $137 billion in potential new investment in Canada over the next five to ten years in different projects or in project expansions across the country.”  The new mining developments are expected to diversify Canada’s mining commodity base beyond diamonds to include minerals such as gold, iron ore, zinc, lead and rare earth elements. As of October 3, 2011, there were 48 mining projects undergoing environmental assessment in Canada, including 14 projects in the Canadian territories, representing “somewhere between $7.5 billion to $8.5 billion in investment.”  The approval of these projects could double the number of full-time jobs in the territories, according to NRCan. Petroleum resources on federal lands north of 60 degrees are regulated by the National Energy Board (NEB) in accordance with the Canada Oil and Gas Operations Act (COGOA) and the Canada Petroleum Resources Act (CPRA). The two statutes also give the Oil and Gas Branch of Aboriginal Affairs and Northern Development Canada (AANDC) the statutory authority to issue exploration, discovery and production rights in the Northwest Territories, Nunavut, and in offshore areas north of 60 degrees. While there is significant potential for conventional oil and gas resource development in the region, there is also evidence of “industry’s rapidly growing interest in Canada’s shale resources [from] 500 kilometres north of 60 to the central Mackenzie Valley.” In 2011, the Oil and Gas Branch issued 11 new exploration licenses to petroleum companies for exploring shale formations; a work expenditure commitment totalling $534 million. “New hydraulic fracturing technologies have the potential to make this vast reserve accessible, but this potential has to be proven by exploration before economics of shale development in this region can be evaluated.” Further north, the Beaufort Sea and Mackenzie Delta region has significant potential for petroleum resource development, with more than 60 discoveries to date. Several companies have been granted deep-water exploration licences in the Beaufort Sea since 2007 (Figure 4). Their cumulative work commitments account for almost $2 billion. 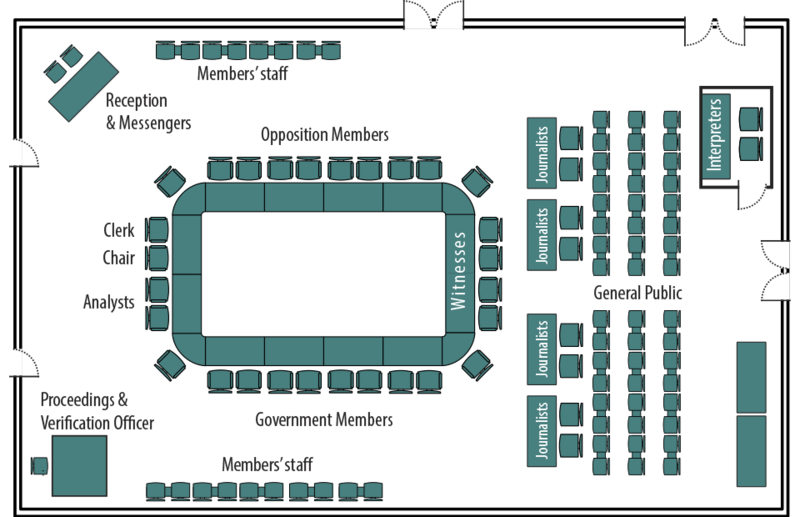 Source: Aboriginal Affairs and Northern Development Canada, Northern Oil and Gas Branch, Oil & Gas Dispositions, June 2012; adapted by the Library of Parliament. Speaking of offshore oil and gas development in the Arctic, Martin Von Mirbach referred to the Beaufort Sea partnership as a good example of multi-stakeholder consultation and planning process. The Beaufort Sea partnership brought together Inuvialuit communities, industry, governments, academia, and regulators to develop an integrated ocean management plan for the Beaufort Sea. He stated that “once it’s done, it’s more politically robust” because all of the stakeholders interests have been considered, and are included in the plan. Ginger Gibson MacDonald, an Adjunct Professor from Norman B. Keevil Institute of Mining Engineering at the University of British Columbia, told the Committee that resource development has to be in line with treaty obligations pertaining to the Aboriginal people and their right to pursue their way of life. She spoke about the need to protect water and animal habitats so that Aboriginal families can maintain their traditional livelihoods through hunting and fishing. Some witnesses pointed out that increases in exploration and development do not necessarily translate to local job impacts. According to Brennain Lloyd of Northwatch, “we saw a 22% increase in the value of mined commodities from 2005 to 2006, just a two-year span, a 45% increase in value of mineral potential, but only a 7% increase in the number of jobs. So for a community looking at employment benefits, we have to look very carefully at this trend of modernizing mining and that volume ratio of mine to jobs is shrinking.” He added that the lack of local ownership and local decision-making can also be a problem for mining communities. “There is a sense in the community that when you have decisions being made on an economic basis by people who are further away, the decisions are less beneficial to the community”. Additionally, Ramsey Hart, Co-manager of Canada Program with MiningWatch Canada, pointed out that northern mines are increasingly based on fly-in camps rather than the development of new mining towns. He also stated that employment at the Meadowbank Mine in Nunavut has had a high turnover rate and that local hires often face a ceiling due to a lack of training. One of the wonderful things about the mines having impact and benefit agreements is that there are dollars that are free to apply to things like education. For example, the Tlicho Nation has $800,000 yearly that they allocate to scholarships for people who are pursuing their education in the south. Those people are then becoming lawyers, or all sorts of different careers are opening up to them. The possibility for them to start to be promoted if they choose to be in mining is certainly there. The impact and benefit agreements have been absolutely fundamental to aboriginal business in the north. Those agreements in themselves require the secure unbundling of contracts so that things aren't so big that you can't possibly bid on them. There's access to capital through government programs. The guarantee, through the agreements, of contracts such as site services have been fundamental to businesses of the north, and have grown them. Several witnesses have identified skilled labour shortages as a significant challenge in mineral and energy resource development. Karina Briño stated that the “the latest statistics, at a national level, indicate that Canada will need about 112, 000 skilled workers for the mining sector alone.” However, as pointed out by Francis Bradley, Vice-President of Policy Development at Canadian Electricity Association, this challenge is not unique to the resource development industry or the North. Many different industry sectors across North America (e.g. electricity and information technology sectors) are competing for the same skilled workers and equipment. Speaking of the labour shortages in Yukon communities, Sandy Babcock, President of the Yukon Chamber of Commerce, noted that “the temporary foreign workers program has been extremely successful and beneficial to our business community, particularly in the capital city of Whitehorse.”  Karina Briño agreed that the foreign workers program is helping industry in meeting the immediate demand for labour; however, more support from the federal and provincial governments is needed for Aboriginal training and capacity building. A number of witnesses underlined the importance of developing human resources in Canada’s North. Considering the relatively high costs associated with attracting labour from the southern parts of Canada, Mitch Bloom, from the Canadian Northern Economic Development Agency, highlighted the economic advantages of maximizing local expertise through training. According to Hilary Jones, “there is a compelling business case for continued human resource investment by the federal government in northern people, not the least of which is the healthy and growing return on investments for resource royalties.” There are three mine training organizations (MTOs) in the north: the NWT’s Mine Training Society, the Yukon Miner Training Association and the Kivalliq Mine Training Society, which she hopes will soon become the Nunavut Mine Training Society. She noted that the mine training societies have been working to ensure that local Aboriginal populations are able to take advantage of the economic and employment opportunities within the mining sector. Furthermore, she pointed out that about 25% of the Mine Training Society’s trainees are Aboriginal women, which is higher than the 5% national average of women in the mining sector. On the subject of training, MiningWatch Canada’s Ramsey Hart told the Committee that the training deficit in the north remains a major challenge that needs to be overcome. John Gingerich, President and Chief Executive Officer of Advanced Explorations Inc., stated that “much more training has to be done [in order to] bring more [...] indigenous peoples, the Inuit, into the workforce so that there is more participation in the wealth generation that comes from mining.” A few witnesses commented on the end of federal funding for the Aboriginal Skills Employment Program (ASEP). According to Pamela Schwann, “programs such as the Aboriginal Skills Employment Program (ASEP) have been very beneficial in the past, as has the national sector council's Mining Industry Human Resources Council; [however], both of these programs are being wound down, or [their] funding has been significantly reduced.” Pierre Gratton reiterated her praise of ASEP, stating that it has been “the most successful Aboriginal-focused training initiative in the country.” Hilary Jones stated that the rate of participation in mining by the local population would decline if the program-funded training society no longer existed. Youth education has been raised as an important issue by several witnesses. Children should be informed of job opportunities that exist in the region through career counselling before they reach the college level. Gordon Macdonald pointed out that while mine training societies and apprenticeship programs proved to be successful, stay-in-school programs, designed to help kids graduate with at least a grade 10 education, are critical for Aboriginal employment and capacity building. There are also other social issues that affect community capacity building and development. Ginger Gibson MacDonald raised this particular point when she spoke about very high levels of unemployment among Aboriginal people. She told the Committee that there are numerous barriers to employment that need to be addressed. “Criminal records and pardons are a big barrier in the north. People don't know they have access to pardons or are simply unable to get rid of the past, barriers of addictions, social traumas that are in place. We haven't tackled the issues associated with families well enough”. Resource development in northern Canada faces major challenges with regard to infrastructure. According to Tara Christie, Senior Advisor at Newmont Mining Corporation, infrastructure issues in the north are wide-ranging, including aging and inefficient community power plants, limited broadband, short, unpaved airstrips, and underdeveloped services at industrial sites. Glen Sibbeston told the Committee that many communities are not served by all-season roads, as most roads end shortly north of 60 degrees. “The Yukon has the best developed road network, the Northwest Territories less so, and Nunavut does not enjoy the benefit of a single highway.” Peter Tapatai confirmed that a lack of transport infrastructure in Nunavut raises the cost of a mine. Compared to the Yukon where start-up costs are around $200 million, mines in Nunavut cost between $1.5 billion and $1.6 billion because companies need to build supporting infrastructure, including roads, rail and ports. According to Glen Sibbeston, in approximate terms, transportation costs exceed $1000 per tonne to move goods to and from locations within 100 kilometres of a highway, and may reach $5,000 per tonne to move goods to sites 300 kilometres from a highway. Furthermore, for destinations served by large runways, goods can be moved for about $2 per kilometre, compared to $10 per kilometre in cases where smaller bush planes are necessary, and $20 per kilometre in more rugged destinations where a helicopter would be required to transfer goods. Lack of transportation infrastructure and the harsh climate conditions of the north present additional challenges to moving equipment that is needed for development. MiningWatch Canada’s Ramsey Hart offered a cautionary tale on infrastructure investment, citing Ontario’s Ring of Fire, where there is massive mineral potential in an area that has very little infrastructure. He told the Committee that the Mattawa and Muskkegowuk First Nations are supportive of development but recognize the impact of infrastructure such as roads and hydro may have on their culture and environment. Peter Jenkins, Mayor of the City of Dawson, told the Committee that “the Government of Canada has an important role to play in developing strategic transportation infrastructure in the north.”  He noted that the Alaska-Canada rail link would effectively move northern resources from various development sites to tidewater export positions. While the rail-link would cost about $11 billion, it would lead to an additional economic output in GDP of $170 billion and create 25,000 new jobs. He also suggested that the government consider extending the Dempster Highway, and developing a deepwater port at King Point on Yukon’s north shore in the Beaufort Sea. Sandy Babcock agreed that port access in the north would offer significant benefits to the resource extraction industry. The availability of energy resources required for mining operations is another major challenge to resource development in northern Canada, according to some witnesses. Peter Jenkins told the Committee that “the development of affordable energy is the biggest single impediment to developing the north’s economy.” Figure 5, provided by Francis Bradley, Vice-President of Policy Development in the Canadian Electricity Association, shows that in 2011, hydro accounted for the majority of power generation in the Yukon and a significant portion in the Northwest Territories. Meanwhile, Nunavut’s power is derived almost exclusively from diesel. Source: Canadian Electricity Association, Brief presented to the Committee, June 5, 2012. Despite the recent investments in energy infrastructure, the Yukon is nearing the upper limits of its hydro capacity partly because of the conversion from fossil fuels to electric heating. According to Peter Jenkins, “Yukon's total current capacity is 129.6 megawatts, with 76.7 megawatts being generated from hydro facilities.” To put things in perspective, the Casino mine alone would require 100 megawatts, and the Selwyn and Mactung mines on the eastern border would require an additional 33 to 45 megawatts. Peter Jenkins also told the Committee that there are a number of potential hydro sites that could be developed to provide affordable energy to the mining industry; however, more investment from different levels of government and the private sector is needed. Peter Mackey, President and Chief Executive Officer of Qulliq Energy Corporation, explained that “electricity generation in the north has traditionally relied on diesel generation,” however due to the increasing costs of fossil fuels, “diesel generation in the long term will not be economical or sustainable.” According to Robin Goad, President of Fortune Minerals Limited, the cost of diesel-powered generation in the Northwest Territories is between $0.20 and $0.30/kWh: five times the cost of electricity in the south. Unlike southern regions, fuel oil and diesel must be shipped by truck or boat to mining sites, where generators are used to produce electricity. This has resulted in Nunavut having the highest power rates in Canada. Because of the high costs of fossil fuels, mining companies have been considering alternative energy sources, such as wind power, in order to generate the electricity required for mining operations. For example, the Diavik diamond mine in the Northwest Territories is in the process of building a 9.2 megawatt wind farm to mitigate the rising cost of fuel. The Government of Northwest Territories is also making substantial investments in biomass, geothermal solar and wind. The Minister of Environment and Natural Resources of the Northwest Territories Government, Michael Miltenberger, told the Committee that “we see these [technologies] as critical developments that are going to allow us to in fact have a sustainable cost of living in the north...” However, Peter Mackey cautioned that the distance involved and the environmental conditions in which these technologies need to be installed add to their overall cost, making them economically less attractive. Nonetheless, Brennain Lloyd noted that there is untapped potential of co-generation technologies to capture energy from waste heat. She also suggested that there is a role for the federal government, in consultation and cooperation with other levels of government, to work on issues such as energy distribution networks. With respect to other potential energy sources, some witnesses presented on the recent development trends in nuclear power. In particular, there has been increasing global activity in the development of small modular reactors (SMR) technology. As noted by Michael Binder, President and Chief Executive Officer of the Canadian Nuclear Safety Commission, the U.S. Department of Energy has allocated $450 million to the Nuclear Regulatory Commission to support the licensing of American-made reactors, and to prove that the technology is viable. According to Christofer Mowry, President of Babcock and Wilcox mPower Inc., Babcock and Wilcox Ltd., small reactors are 15% the size of a standard, large 1,000-megawatt plant, giving them an advantage in terms of siting flexibility. He also added that “SMRs directly address the key challenges associated with the construction of large nuclear plants, including financial risks, cost and time uncertainty, production bottlenecks, and expensive power grid upgrades.” He told the Committee that SMRs can help various regions across Canada eliminate coal-powered generation, and at the same time allow them to meet the expected growth in energy demand. Similarly, Peter Jenkins indicated that nuclear power presents an opportunity to meet growing demand for energy, and provides an alternative to fossil fuels. Several witnesses have expressed concerns regarding community capacity and aging infrastructure. Growth in the resource development sector is adding significant pressure on northern communities’ services and infrastructure including airports, communications, power generation and health care. According to Sandy Babcock, “the resource sector places heavy demands on transportation and energy infrastructure, broadband width, and labour markets.” Melissa Blake, Mayor of Regional Municipality of Wood Buffalo, stated that the capacity of her municipality has not kept pace with the fast development of the oil sands and as a result, faces increasing challenges in “access to land, transportation, and labour supply.” She added that “while [the municipality] appreciates the recent budget announcements for expedited processing for temporary workers, it would be an immense asset if we not only had customs at our airport but also if there were immigration officials directly in Fort McMurray for visa processing and other related issues. This is not only of benefit to our labour force, but it helps with our goal to create a welcoming and inclusive community.” She also expressed concern regarding the discontinued federal funding for the operations of Fort Chipewyan Airport. Homes are desperately needed. I'm sure that everybody here is aware of that. This causes overcrowded housing, which causes many health and well-being issues. This then stresses the health care system. We need more doctors. We have a hospital in Rankin and in Iqaluit, but again, there's a shortage of doctors and nurses. The Canadian Environmental Assessment Agency (CEAA) is not usually involved in mining projects in the Canadian territories. According to Helen Cutts, from the CEAA, environmental assessment regimes north of 60 degrees depend on “particular arrangements through comprehensive [land] claims.” In the Northwest Territories, Yukon and Nunavut, individual boards are typically established according to these land claims, and CEAA has “virtually no involvement”. However, in some cases, typically when trans-boundary considerations are involved, a project may be referred to the federal Minister of the Environment. Similarly, Patsy Thompson, Director General of Environmental and Radiation Protection Assessment at the CNSC, mentioned that the role of CNSC in regulating nuclear projects in the territories would be to support the territorial boards by providing scientific and technical support for all aspects of the environmental assessment, and coordinating the scientific support with other federal government agencies like Environment Canada and Fisheries and Oceans Canada (DFO). A number of witnesses have expressed environmental concerns regarding mining activities in northern Canada. According to Ugo Lapointe, “one of the concerns rightly expressed by the population concerns the long-term management of mine tailings”. In the case of metal mines, contaminants or toxic elements (e.g., heavy metals) are often released, presenting risks such as acidification or acid mining drainage. In the case of uranium mines, radioactive releases (e.g., thorium and radium) present additional challenges to managing mine tailings. Brennain Lloyd, Project Coordinator with Northwatch, stated that “the disturbance from mineral exploration can be quite extreme, with a complete removal of vegetation and a total loss of ecological function at the site level.” Large, low-grade, open mines are often in close proximity to existing communities, particularly in northern Quebec. The impacts of these mines on the natural environment, including the noise and dust they produce, can be a nuisance to local inhabitants. On the subject of offshore oil development, Martin von Mirbach noted that “there is currently insufficient knowledge and inadequate technology and infrastructure to safely carry out drilling in Canadian Arctic [....] there’s no oil spill response capacity to address a sizeable well blowout or large scale spill in Arctic waters.” The lack of infrastructure is a big challenge in addressing an oil spill in the Arctic. The presence of ice adds significant complexity to containing the spill, making it very difficult to clean up an oil spill. More time, research and large-scale planning is needed to address these gaps and to ensure sustainable development in the Arctic. Martin von Mirbach also proposed cumulative environmental assessments in the region to set overall thresholds and identify areas where it is appropriate to carry out activity and areas where it is not. He also said that the NEB should be responsible for modelling the trajectory of possible oil spills. As part of its study on the development of natural resources in northern Canada, the Committee devoted two meetings to hearing witnesses specifically on the development of a whole new region of northern Ontario known as the “Ring of Fire”. Located in a remote and under-developed area, the Ring of Fire represents a singular and challenging case in itself. The Ring of Fire area stands in the James Bay Lowlands of northern Ontario, approximately 1,000 kilometres northwest of Toronto (Figure 6). Mineral exploration in the area began in 2002 and initially led to the discovery of copper and zinc deposits. In 2008, a large chromite deposit was found. Chromite is used primarily to make an alloy, ferrochrome, a component of stainless steel. Although the chromite discoveries in the Ring of Fire may someday rank amongst the largest in the world, the chromite market is presently tight, most of it currently being consumed in Asia. a ferrochrome production facility located in Canada to refine approximately 60% of the concentrated chromite ore into ferrochrome, which is used in the production of stainless steel. The company envisages exporting approximately 40% of its on-site production, arguing that being “able to sell into the global market for chromite concentrate is key to being able to build a mine”. In fact, the development of the Ring of Fire area will depend to a great extent on global market conditions, knowing that the market for chromite and ferrochrome is extremely volatile and closely related to the Chinese demand. According to William Boor, Cliffs’ overall project represents a potential investment of approximately $3.5 billion, the creation of over 1,100 permanent jobs, an equal number of construction jobs, and 2,000 to 3,000 indirect jobs. Source: Ontario Business Report, Ring of Fire lights up Northern Ontario’s mining industry, http://ontariobusinessreport.com/en/economic/articles/economic_article_27.asp. The achievement of Cliffs Natural Resources’ project is also key to further developing the Ring of Fire. As pointed out by Ronald Coombes, Cliffs “has a deposit with the economic size to support initial infrastructure costs, which will allow other smaller mines to be economical”. This would likely be the case of projects being undertaken by Noront and White Tiger to develop their nickel and iron deposits in a few years from now, once the Ring of Fire is more accessible and has the proper infrastructure to do so. Noront’s approach would be to mine its Eagle’s Nest nickel ore first, which would offer a greater return on investment, and then look at supplying the North American market from its Blackbird chromite deposit, it being “a better fit for the company's size”. White Tiger Mining Corporation owns the Norton Lake property where it is contemplating the development of its nickel, copper, cobalt, and PGM (Platinum Group Metals) deposit once the proposed north-south road corridor is approved. Many other opportunities could evolve from the future construction of the road along the proposed corridor. While recognizing the immense mining potential buried underground in the Ring of Fire, all witnesses heard by the Committee stressed that this mining potential could hardly materialize without overcoming unprecedented challenges. These challenges are quite similar to those identified for resource development north of 60, but they are magnified in all aspects when transposed in the context of northern Ontario’s Ring of Fire. They include: ecosystem sensitivity; remoteness and lack of infrastructure; consultation with First Nations; and, education and training. The Ring of Fire is located in the James Bay Lowlands, a large wetland area. The region is poorly drained, dominated by marsh, string bogs and muskeg, and is dissected by slow-flowing rivers draining into Hudson’s Bay and James Bay. Mine exploration and development, as well as building the required infrastructure in such a fragile and pristine environment will require comprehensive planning and consultation with First Nations. New infrastructure will have to be carefully planned in order to minimize the impacts on fish, wildlife, and plants on which local communities rely. In fact, “new roads and infrastructure corridors, including a proposed slurry pipeline, will fragment the habitat of migratory animals — caribou, moose, etc. — and disrupt their travel routes. [...] Fuel and chemicals required by the mines present major environmental concerns [and] waste rock and tailings from the mines have the potential to release harmful chemicals to the environment and will remain on the land long after the mines are closed.” First Nations communities expect these important issues to be fully addressed through a thorough and comprehensive environmental assessment process. The population of the Ring of Fire region includes small, isolated First Nations communities established along the suture line between the lowlands and the drier Canadian Shield, and the Hudson Bay and James Bay coast. The remote location of the Ring of Fire explains why exploration costs are “at least ten times than the costs in Sudbury” and why it “is not attractive to many professionals”. Moreover, the total absence of infrastructure represents the first and foremost impediment to resource development in the area. an east-west all-weather corridor from Noront Resources Eagle's Nest nickel deposit site to Pickle Lake. Cliffs’ north-south all-season road “would be the catalyst for this Ontario infrastructure”, serving “to open up the Ring of Fire to further investment by other mining companies”. “In addition to opening up the region, the all-weather road would provide connection opportunities for remote First Nations communities”. The construction costs have been estimated at $500 million and it is believed that “the choice of the route will be a major determiner of global cost competitiveness for the entire region”. On the energy side, the needs are also tremendous. For instance, Cliffs Natural Resources would need 300 megawatts to operate its mine and concentrator at its site, and another 300 megawatts for the ferrochrome processing plant that could be built near Capreol, north of Sudbury. With respect to the ferrochrome facility, the City of Greater Sudbury spoke of its smelting and refining capacity for the Ring of Fire mining region. Noront Resources’ smaller project would necessitate approximately 25 megawatts for the concentrator and mine at its Eagle’s Nest site. This amount of energy could be provided by a diesel generating station built close to the community of Webequie, through a power line from that point. A major problem with opening up a territory that has virtually no infrastructure remains to determine who should bear the costs for building the new roads and supplying the energy needed for developing the Ring of Fire area. According to some witnesses, the mining industry would consider entering into public-private partnerships, as long as governments recognize that such infrastructure would clearly benefit local communities. For example, it has been suggested that the current proposed routes offer “an opportunity to extend line power to the communities as well as upgrading the telecommunications capacity”. While all new infrastructure will offer business opportunities for First Nations, some First Nations representatives believe that the construction of transmission corridors and mining facilities have the potential to justify electrification in their communities. David Kilgour told the Committee that the federal government must participate in partnership with other levels of government and the private sector in the strategic infrastructure investments required to take full advantage of existing and emerging opportunities. He added that these infrastructure investments should enhance community and economic development, in addition to simply meeting the goals of resource development. Most witnesses heard by the Committee, both from the industry and First Nations, expressed their concerns with respect to the consultation and participation of the latter. Although the “Ring of Fire development will provide a key test on existing provincial policy”, the federal duty to consult has also been raised. Some mining companies testified they were unclear on obligations related to the legal duty to consult provisions and asked for clarity from all levels of government. Ronald Coombes stated that “the industry needs the Government of Canada to provide clarity and direction to the current uncertainty in the resource industry. What is meant or required as “duty to consult” with First Nations?” He recognized the industry’s duty to engage in socio-economic participation agreements, but stressed that it could hardly be done at the exploration stage when a project has no economic value. He rather suggested that First Nations should focus on discussion and negotiation with the Government of Canada. Chief Moonias added that “development has to occur in a way that Marten Falls First Nation can accept, and this means having a final say in whether and how it happens. We share a responsibility with Canada under our treaty to make sure that development in the Ring of Fire is sustainable and environmentally sound.” First Nations are calling for the establishment of positive working relationships with mining companies to promote additional benefits in terms of employment, the use of traditional ecological knowledge, education, skills training, including financial compensation. They are looking for “a coordinating mechanism at the political level, hopefully, to engage the Ontario cabinet members and federal representatives, including First Nations’ leadership”. Ronald Coombes told the Committee that consultation with First Nations is very important since the development of new mines is planned in their communities. “[T]hey certainly have the right to know what's happening or what's going to happen and what future ramifications there are.” William Boor said that, since early 2010, Cliffs Natural Resources has been communicating, consulting, providing capacity funding, and working directly with the affected First Nations communities in the Ring of Fire, adding that Cliffs is committed to seeing First Nations participate in, and benefit from, the projects. For Ian Brodie-Brown, since the “resources assets” are in First Nations’ territories, there is a need for “establishing a way for First Nations to be involved in the ownership of the companies”. Raymond Ferris, Coordinator, Ring of Fire, for Matawa First Nations communities also said: “We are pro development, as long as we are protecting our resources and traditional lands for the benefit of future generations… The Ring of Fire creates a tremendous opportunity whereby the mining corporations can also support investment for community infrastructure in First Nations through partnership agreements and/or impact benefit agreements. Such investment precedents have already been established with aboriginal organizations and communities in the Northwest Territories and Nunavut”. According to those communities, problems surface when consultation and partnerships are ignored. Nishnawbe Aski Nation Deputy Grand Chief Les Louttit cited the example of the De Beers Victor Mine in Attawapiskat First Nation negotiating an Impact Benefit Agreement (IBA) that “set the bar very low in terms of benefits, especially financial benefits, and only after that agreement did they negotiate with three other First Nations on the James Bay Coast.” Chief Louttit said he would reject that kind of agreement with Ring of Fire mining companies. The development of the Ring of Fire mineral potential may result in huge economic impacts for Ontario, and particularly for surrounding First Nations communities. It should “provide unique opportunities for First Nations to plan for sustainable economic development in several broad areas: workforce training, land use planning, service and manufacturing industries, business partnerships, and equity participation, including regional and community infrastructure development”. He added that “With the proper education and training, our growing First Nation population of youth will be northern Ontario's future workforce”. One of the main challenges with the training and employment of Aboriginal people in the Ring of Fire area is that many of the new jobs are highly technical, while the education level of the people is not very high. According to Wes Hanson, developing Noront Eagle Nest’s site would require “60% unskilled labour, 20% skilled labour, and 20% professional.” The company is encouraging local communities to stay in school and get their grade 12 education, and has developed a post-secondary bursary program to encourage Aboriginal youth to look at post-secondary education in such fields as geology, engineering and environmental sciences. Through the course of the mine development, the needs will be for trades, such as electricians, carpenters, plumbers, and then for skilled underground labour in mining process and in heavy equipment operation. For the mining companies already involved in the Ring of Fire, there is a clear need for engaging with communities early in the discussion to identify the specific training plans and programs that can be developed in the area. It was mentioned that the training facility built by De Beer’s Victor Mine in Attawapiskat as part of the IBA negotiations is currently closed and could serve as a potential site for initial training of Aboriginal people. Anil Aurora told the Committee that the regulatory environment in northern Canada is often cited as “one of the biggest challenges” to investors, particularly foreign investors. According to John Gingerich, the permitting processes in northern Canada “are not aligned with the logic of the exploration processes [...]” The industry’s operating season is four months long, while permits often take over four months to be granted, thereby adding to the cost of the overall project. Mark Kolebaba reiterated John Gingerich’s concerns, stating that missing an exploration season results in a setback of one year, which reduces the credibility of project developers to their investors. He said to the Committee that: “we need to streamline the regulatory process. We have a short season in the Arctic. All the companies understand the need for a regulatory process. We need it streamlined so that we don't miss seasons. Every time we miss a work season, it's a setback of a year. It means a year longer that mineral surveys aren't finished. We also lose credibility with our investors. The investment dollar, because it can't wait forever, goes to southern projects or to companies working in southern parts of the world. Streamlining would make it more productive.” Similarly, Chris Hanks, Vice-President, Environmental Affairs, with Hope Bay Mining Ltd. said that “in order to facilitate exploration and development in the Arctic, it is essential to have a regulatory framework that is protective of the environment, provides local benefits, and can happen in a time that allows companies to make timely economic decisions.” Speaking of the overall regulatory process, William Boor said that “one of the main things I'd like to dispel is the concept that longer equals more rigorous or more thorough. The comprehensive review can address the things that I've heard”. According to Janet King, “Nunavut has a single land claim agreement between the Inuit of Nunavut and Canada signed in 1993.” Nunavut’s regulatory regime for project development is based on this agreement, and it consists of five boards that deal with land use planning, environmental assessment, water rights issuance, surface rights disputes and wildlife management. According to the Honourable Peter Taptuna, “[t]he Nunavut Impact Review Board is legislated under the Nunavut land claims agreement, and for the most part it's been a small organization since 1999. The expansion and growth in exploration activity has grown in tremendous proportions, and the application process has been slowed down because of the lack of resources within these regulatory bodies, including the Nunavut Planning Commission and the Nunavut Water Board.” Larry Connell, Vice-President of the NWT and Nunavut Chamber of Mines, mentioned that at a meeting in Rankin Inlet, “the Kivalliq Inuit Association spoke to the Nunavut Impact Review Board, and even they said that this process needs to be streamlined, that there are too many repetitious steps in the middle, and that we can make it more efficient”. In the Yukon, the management and administration of lands and resources was transferred to the Government of Yukon in 2003 as a result of the Yukon Northern Affairs Program Devolution Transfer Agreement. The Yukon Environmental and Socio-Economic Assessment Act (YESAA) was passed to regulate the transferred responsibilities. Several witnesses referred to YESAA as a good model for improving other regulatory processes. Peter Jenkins told the Committee that “YESAA up to this point in time has been the most progressive assessment and permitting process in Canada, with its fixed timelines providing certainty for investors.” Sandy Babcock reiterated this point by saying that “with the Yukon Environmental and Socio-economic Assessment Act, we feel we have that regulatory certainty. There are timelines entrenched in the regulations whereby not only the review committee has to respond to project applications but the proponents as well. That really has been instrumental in the Yukon moving forward with its resource development in the area of mining, but it also encompasses all other land-based activities. They also go through the process. It really has been instrumental in our success here. I can't stress strongly enough that the timelines being entrenched in the regulations were critical.” Peter Jenkins did note, however, that there are still some problems with YESAA, including one that concerns interpretations of adequacy of information. He said that “there appear to be some different interpretations as to when enough information has been submitted on a project to assess the project and the decision body being able to make its decision.” He also suggested amendments to YESAA in light of the recent amendments made to CEAA. Speaking of the federal regulatory process, Pamela Schwann told the Committee that “the federal environmental assessment process suffers from systemic delays and a lack of coordination between federal departments,” as noted by the Commissioner of the Environment and Sustainable Development. Furthermore, Tara Christie pointed out that the regulatory regime is usually carried out as successive processes, where, for example, regulators would wait until assessors have done their work in order to begin working. She stated that introducing more concurrent processes would improve the efficiency of the regulatory regime. John Gingerich also raised a point about the regulatory framework presenting some issues for shipping: “every ship is looked at as an incremental issue on an environmental basis, where that just becomes a bottleneck and fails to address [...] a larger vision.” He pointed out that increased development in the north will also result in increased shipping. He suggested that the government come up with a national strategy on shipping permits in northern Canada. With regard to environmental assessment of resource development projects, Brennain Lloyd of Northwatch told the Committee: “we need an integrated approach, a planning approach and an environmental assessment...that looks at all of the projects over time, and looks at all the consequences of these projects.” Ramsey Hart also said that MiningWatch Canada hopes that Canada “will pursue a strong and rigorous environmental and socio-economic review process for extractive projects”. According to Martin von Mirbach, the regulatory review process for offshore oil and gas activity would be less costly and time consuming if it took place in the context of previously completed regional marine spatial plan. It is also important to strengthen the circumarctic governance regime for offshore development through initiatives to create internationally binding rules on offshore Arctic oil development. Several witnesses mentioned the territorial borrowing limit as a significant obstacle to funding capital projects in the north. According to Peter Mackey, the Government of Nunavut’s ability to borrow to fund its infrastructure needs is limited by its “debt cap” of $400 million. The Honourable Michael Miltenberger also noted that the Government of Northwest Territories has to operate within a fiscal constraint that is determined by the borrowing limit of $800 million. Hughie Graham told the Committee that “the ability for the Government of Canada to increase the territorial borrowing limit when necessary is certainly critical to investing in major infrastructure projects in the Northwest Territories.” Similarly, Eberhard Scherkus pointed out that hamlets in northern Canada do not have sufficient taxation powers, which affects the municipal revenues from mining projects. According to him, improving municipal taxation powers would “help build capacity and increase local accountability.” Kirk McKinnon, President and Chief Executive Officer at MacDonald Mines Exploration Ltd., also pointed out that doubling flow-through opportunity for a specific period of time can help stimulate investment in resource development. The Committee recommends that the Government of Canada continue to support geoscience programs in order to improve the development prospects of northern energy and mineral resources, and specifically renew the geo-mapping for energy and minerals (GEM) program to another productive five-year term. Furthermore, the Committee recommends that the Government of Canada improve the infrastructure necessary to support geoscience initiatives in northern Canada. The Committee recommends that the Government of Canada work to maximize the use of space-ground infrastructure in order to advance the utilization of satellite data. Furthermore, the Committee recommends that the government work with the international community to harmonize geo-reference standards in order to facilitate the sharing of geoscience knowledge between countries and organizations around the world. The Committee recommends that the Government of Canada, where there are willing partners, accelerate its work regarding unsettled land claims in northern Canada in order to protect the rights of Aboriginal communities as well as secure the investment environment for developers in the North. In particular, the Committee recommends that the government complete the implementation of the Nunavut Land Claims Agreement and other land claims, including the passage of the Nunavut Planning and Project Assessment Act. The Committee recommends that the Government of Canada increase its support to mining training initiatives, particularly for First Nations and Inuit communities, in order to help develop the labour force required to support economic diversification and mining projects in northern Canada. The Committee also recommends that the Government of Canada continue to support research initiatives in northern Canada, in order to improve the prospects of mining development, as well as the overall economic prosperity of northern communities. The Committee recommends that the Government of Canada continue to address infrastructure challenges in northern Canada, particularly with regard to transportation and energy infrastructure, in order to improve the region’s economic development potentials. To facilitate the development of nuclear energy technology in Canada and harmonize nuclear energy liability terms with international standards, the Committee recommends that the Government of Canada ratify the Convention on Supplementary Compensation for Nuclear Damage. The Committee recommends that the Government of Canada work towards clarifying the duty to consult policy, in order to improve Aboriginal consultation and engagement in resource development projects. The Committee recommends that the Government of Canada continue to support capacity-building and infrastructure in northern communities, in order to help them meet the growing demand for essential services and improve community access. Moreover, the Committee recommends that the Government of Canada continue to analyze territorial borrowing limits to determine if the current levels are appropriate to meet the current needs. The Committee recommends that the Government of Canada work towards reducing inefficiency and delays in the current regulatory process, in order to improve prospects of northern resource development. In particular, the Committee recommends that the Government of Canada work with provincial governments to harmonize the federal and provincial regulatory processes, in order to avoid duplication. The Committee recommends that the Government of Canada provide support to the Territories, in order to help improve their regulatory institutional capacity for reviewing resource development projects. For the purpose of this study, the Committee agreed to consider primarily the territories north of the 60th parallel, along with the northern portion of the provinces. James Ferguson, Chair and Acting President, Geomatics Industry Association of Canada, Evidence, October 24, 2011. Keith Morrison, Chief Executive Officer, Gedex Inc., Evidence, October 26, 2011. Anil Arora, Assistant Deputy Minister, Minerals and Metals Sector, Natural Resources Canada, Evidence, October 3, 2011. Steve MacLean, President, Canadian Space Agency, Evidence, October 24, 2011. David J. Scott, Director, Geological Survey of Canada, Northern Canada Division, Natural Resources Canada, Evidence, October 19, 2011. Brian Gray, Assistant Deputy Minister, Earth Sciences Sector, Natural Resources Canada, Evidence, October 19, 2011. John Percival, Program Manager, Geomapping for Energy, Natural Resources Canada, Evidence, October 19, 2011. David J. Scott, Director, Geological Survey of Canada Northern Canada Division, Natural Resources Canada, Evidence, October 19, 2011. Mitch Bloom, Vice-President, Policy and Planning, Canadian Northern Economic Development Agency, Evidence, October 17, 2011. Richard Moore, Chair, Geosciences Committee, Prospectors and Developers Association of Canada, Evidence, October 24, 2011. Pamela Schwann, Executive Director, Saskatchewan Mining Association, Evidence, October 31, 2011. John Gingerich, President and Chief Executive Officer, Advanced Explorations Inc., Evidence, October 26, 2011. Anil Arora, Assistant Deputy Minister, Minerals and Metals Sector, Natural Resources Canada, Evidence, October 3, 2011; Brian Gray, Assistant Deputy Minister, Earth Sciences Sector, Natural Resources Canada, Evidence, October 19, 2011. Eberhard Scherkus, President and Chief Operating Officer, Agnico-Eagle Mines Limited, Evidence, November 23, 2011. Dan Tolgyesi, President and Chief Executive Officer, Québec Mining Association, Evidence, November 30, 2011. Pierre Gratton, President and Chief Executive Officer, Mining Association of Canada, Evidence, November 2, 2011. David Kilgour, Councillor, City of Greater Sudbury, Evidence, February 16, 2012. Mimi Fortier, Director General, Northern Oil and Gas Branch, Aboriginal Affairs and Northern Development Canada, Evidence May 10, 2012. Michael Hudson, Deputy Assistant Deputy Attorney General, Justice Canada, Evidence, October 5, 2011. Hughie Graham, President, Northwest Territories Chamber of Commerce, Evidence, June 12, 2012. Karina Briño, President and Chief Executive Officer, Mining Association of British Columbia, Evidence, June 21, 2012. Martin von Mirbach, Director, Canadian Arctic Program, World Wildlife Fund Canada, Evidence, May 15, 2012; Mimi Fortier, Director General, Northern Oil and Gas Branch, Aboriginal Affairs and Northern Development, Evidence, May 10, 2012. Martin von Mirbach, Director, Canadian Arctic Program, World Wildlife Fund Canada, Evidence, May 15, 2012. Mimi Fortier, Director General, Northern Oil and Gas Branch, Aboriginal Affairs and Northern Development, Evidence, May 10, 2012. Mark Kolebaba, President and Chief Executive Officer, Diamonds North Resources Ltd., Evidence, October 26, 2011; Anil Arora, Assistant Deputy Minister, Minerals and Metals Sector, Natural Resources Canada, Evidence, October 3, 2011; Ugo Lapointe, Cofounder, Coalition pour que le Québec ait meilleure mine, Evidence, October 31, 2011; Tom Hoefer, Executive Director, NWT and Nunavut Chamber of Mines, Evidence, November 23, 2011; Donald Bubar, President and Chief Executive Officer, Avalon Rare Metals Inc, Evidence, November 21, 2011. Mark Kolebaba, President and Chief Executive Officer, Diamonds North Resources Ltd., Evidence, October 26, 2011. Ugo Lapointe, Cofounder, Coalition pour que le Québec ait meilleure mine, Evidence, October 31, 2011. Glen Sibbeston, Chief Pilot, Trinity Helicopters, Evidence, December 5, 2011. Ginger Gibson MacDonald, Adjunct Professor, Norman B. Keevil Institute of Mining Engineering, University of British Columbia — as an individual, Evidence, June 19, 2012. Eberhard Scherkus, President and Chief Operating Officer, Agnico-Eagle Mines Limited, Evidence, November 23, 2011; Gary Merasty, Member, Saskatchewan Mining Association, Evidence, October 31, 2011; Clair Derome, President, Yukon Chamber of Mines, Evidence, December 7, 2011. Tom Hoefer, Executive Director, NWT and Nunavut Chamber of Mines, Evidence, November 23, 2011. Hilary Jones, General Manager, Mine Training Society, Evidence, November 21, 2011. Peter Tapatai, Representative, Hamlet of Baker Lake, Evidence, June 7, 2012. Peter Taptuna, Minister of Economic Development and Transportation, Government of Nunavut, Evidence, June 19, 2012. Brennain Lloyd, Project Coordinator, Northwatch, Evidence, December 7, 2011. Ramsey Hart, Co-manager, Canada Program, MiningWatch Canada, Evidence, November 2, 2011. Hughie Graham, President, Northwest Territories Chamber of Commerce, Evidence, June 12, 2012; Sandy Babcock, President, Yukon Chamber of Commerce, Evidence, June 12, 2012. Gordon Macdonald, Principal Advisor, Sustainable Development, Diavik Diamond Mines Inc., Evidence, June 21, 2012. Donald Bubar, President and Chief Executive Officer, Avalon Rare Metals Inc., Evidence, November 21, 2011. Robin Goad, President, Fortune Minerals Ltd., Evidence, November 21, 2011. Wes Hanson, President and Chief Executive Officer, Noront Resources, Evidence, February 16, 2012. Karina Briño, President and Chief Executive Officer, Mining Association of British Columbia, Evidence, June 21, 2012. This figure was projected for 2021 by the Mining Industry Human Resources Council in the Canadian Mining Industry Employment and Hiring Forecasts 2011. Francis Bradley, Vice-President, Policy Development, Canadian Electricity Association, Evidence, June 5, 2012. Sandy Babcock, President, Yukon Chamber of Commerce, Evidence, June 12, 2012. Claire Derome, President, Yukon Chamber of Mines, Evidence, December 7, 2011. Sandy Babcock, President, Yukon Chamber of Commerce, Evidence, June 12, 2012; Peter Tapatai, Representative, Hamlet of Baker Lake, Evidence, June 7, 2012. Pujjuut Kusugak, Mayor, Hamlet of Rankin Inlet, Evidence, June 7, 2012. Ginger Gibson MacDonald, Adjunct Professor, Norman B. Keevil Institute of Mining Engineering, University of British Columbia – as an individual, Evidence, June 19, 2012. Tara Christie, Senior Advisor, External and Government Affairs, Hope Bay Mining Ltd, Newmont Mining Corporation, Evidence, November 23, 2011. Peter Jenkins, Mayor, City of Dawson, Evidence, June 7, 2012. Francis Bradley, Vice President, Policy Development, Canadian Electricity Association, Evidence, June 5, 2012. Peter Mackey, President and Chief Executive Officer, Qulliq Energy Corporation, Evidence, June 5, 2012. Michael Miltenberger, Minister of Environment and Natural Resources, Government of the Northwest Territories, Evidence, June 19, 2012. Michael Binder, President and Chief Executive Officer, Canadian Nuclear Safety Commission, Evidence, May 15, 2012. Christofer Mowry, President, Babcock and Wilcox mPower Inc., Babcock and Wilcox Ltd, Evidence, May 15, 2012. Melissa Blake, Mayor, Regional Municipality of Wood Buffolo, Evidence, June 5, 2012. Melissa Blake, Mayor, Regional Municipality of Wood Buffolo, Evidence, June 5, 2012; Peter Mackey, President and Chief Executive Officer, Qulliq Energy Corporation, Evidence, June 5, 2012; Pujjuut Kusugak, Mayor, Hamlet of Rankin Inlet, Evidence, June 7, 2012; Peter Tapatai, Representative, Hamlet of Baker Lake, Evidence, June 7, 2012. Ginger Gibson MacDonald, Adjunct Professor, Norman B.Keevil Institute of Mining Engineering, University of British Columbia — as an individual, Evidence, June 19, 2012. Helen Cutts, Vice-President, Policy Development Sector, Canadian Environmental Assessment Agency, Evidence, October 5, 2011. Patsy Thompson, Director General, Directorate of Environmental and Radiation Protection Assessment, Canadian Nuclear Safety Commission, Evidence, May 15, 2012. Jody Kuzenko General Manager, Sustainability, Base Metals, North Atlantic Region, Vale, Evidence, June 21, 2012. William Boor, Senior Vice-President, Global Ferroalloys, Cliffs Natural Resources Inc., Evidence, February 14, 2012. Ronald Coombes, President, White Tiger Mining Corporation, Evidence, February 14, 2012. Wes Hanson, President and Chief Executive Officer, Noront Resources, Resource Development in The North: Mining - Ring Of Fire, Brief presented to the Committee, February 16, 2012. Raymond Ferris, Coordinator, Ring of Fire, Matawa First Nations, Evidence, February 14, 2012. Raymond Ferris, Coordinator, Ring of Fire, Matawa First Nations; Les Louttit, Deputy Grand Chief, Nishnawbe Aski Nation, Evidence, February 14, 2012. Les Louttit, Deputy Grand Chief, Nishnawbe Aski Nation, Evidence, February 14, 2012. Elijah Moonias, Chief, Marten Falls First Nation, Evidence, February 16, 2012. Ian Brodie-Brown, President and Chief Executive Officer, AurCrest Gold Inc., Evidence, February 16, 2012. Janet King, Assistant Deputy Minister, Northern Affairs Organization, Aboriginal Affairs and Northern Development Canada, Evidence, October 17, 2011. Chris Hanks, Vice-President, Environmental Affairs, Hope Bay Mining Ltd., Newmont Mining Corporation, Evidence, November 23, 2011. Larry Connell, Vice-President, NWT and Nunavut Chamber of Mines, Evidence, November 23, 2011. John Merritt, Senior Policy Advisor, Inuit Tapiriit Kanatami, Evidence, November 23, 2011. John Cheechoo, Director, Inuit Tapiriit Kanatami, Evidence, November 23, 2011. Ginny Flood, Director General, Minerals and Metals Sector, Natural Resources Canada, Evidence, October 3, 2011. Francis Bradley, Vice-President, Policy Development, Canadian Electricity Association, Evidence, June 6, 2012. Jody Kuzenko, General Manager, Sustainability, Base Metals, North Atlantic Region, Vale, Evidence, June 21, 2012. Martin von Mirbach, Director, Canadian Arctic Program, World Wildlife Fund, Evidence, May 15, 2012. Kirk McKinnon, President and Chief Executive Officer, MacDonald Mines Exploration Ltd., Evidence, February 16, 2012. In August 2012, a new resource revenue-sharing agreement was signed between the Yukon and the federal governments.